As the trees change their wardrobe to the beautiful gold and red of autumn and the days get crisper and shorter, it is natural for us to start turning within and take some time to consider that which is most important. 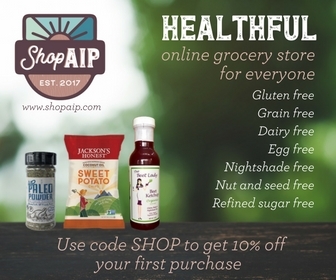 Unfortunately, it seems that the official Thanksgiving holiday we traditionally celebrate at home with our nearest loved ones is being supplanted by the commercial “buy more” mentality as catalogs are already filling the mailbox, decorations are appearing everywhere, and major stores announcing that they will start their black Friday sales on Thursday. Don’t get me wrong… I do believe in capitalism and will likely be doing my share to stimulate the economy this holiday season. I just wish all those people who want a piece of my pocketbook to wait until after we’ve celebrated what used to be my favorite holiday! So I’m taking November back for Thanksgiving and celebrating it every day! I’m taking a few moments each day to reflect on all the blessings in my life and publicly state them. Day 1: I’m grateful that my life has not been easy. My personal health challenges, the loss of loved ones, and the many other tests I’ve endured have made me stronger than I could have ever imagined and insure that I appreciate all the good things in my life. Day 2: I am grateful for the love and support of my husband who during the first few months of our marriage found himself sitting next to my ICU hospital bed and has stood next to me through the roller coaster ride of the years that followed. I would not be gutsy by nature without him. Day 3: I am grateful for my pets, past and present. 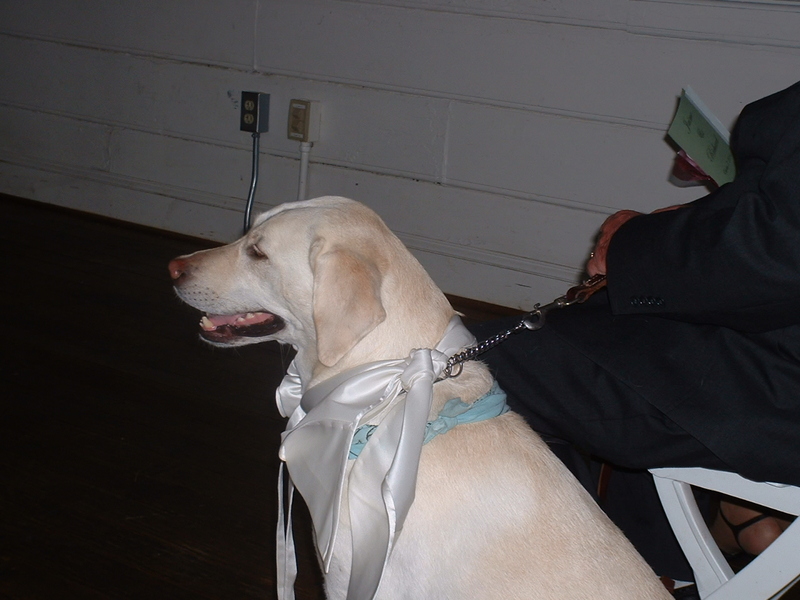 True story – My husband and I were “introduced” by his dog and then she was the ringbearer in our wedding. Later when I was lying in a hospital bed, thoughts of coming home to that dog gave me the strength to recover and heal. Sadly, we lost Kili to a brain tumor and now we are honoring her memory by training our current dog to be a therapy dog and perhaps provide that comfort and motivation for someone else suffering from illness and pain. 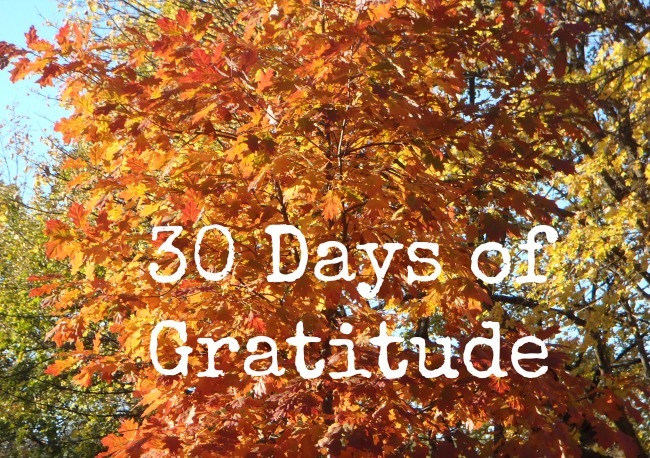 Day 4: This one is simple… Today I am grateful that I have enough to eat and I know where my next meal is coming from. Last night we watched the film A Place At The Table and it reminded me that 50 million Americans can’t say that, even though we live in the richest country in the nation where there is plenty of healthy food to go around but our mixed up policies keep it out of the mouths of the young people who need it for their bodies and brains to develop and grow. It is criminal – and it hurts us all! “If another nation were doing this to our children, we’d be at war,” said actor Jeff Bridges, who appears in the film. If you haven’t seen it yet, I strongly recommend you do. It is currently streaming on Netflix and also available for free to Amazon prime members or for a $3.99 rental. Day 6: I am grateful that I have the ability to read and write, which continues to unlock a world of knowledge and opportunity for me. I believe so strongly in this that in my day job I work with schools to bring them resources and programs that support development of literacy skills for today’s students. After the basic physical needs are met, the ability to communicate is key to modern man’s survival! Day 7: I am grateful to live in the beautiful state of Virginia! I’ve been here for a little over 7 years now and am not sure when exactly it started to feel like “home” but now I can’t really imagine living anywhere else. It’s not perfect, of course (what place is? ), but the people are warm and welcoming, there is natural beauty all around (especially with the autumn colors), and it suits us.